Three years after the alcohol-related death of Scott S. Krueger ’01, MIT has agreed to pay $6 million for its role in his death. Of this amount, $1.25 million will be contributed to a scholarship in Krueger’s memory and $4.75 million will be paid to his parents as compensatory damages. The agreement included a public apology by President Charles M. Vest for MIT’s role in Krueger’s death. “At a very personal level, I feel that we at MIT failed you and Scott. For this you have our profound apology,” said Vest in a recent letter to the Krueger family. Darlene Krueger, Krueger’s mother, believes that this public apology was the most important portion of the settlement. “I think MIT will stand all the stronger for standing up and saying, ‘we were wrong,’” she said. The Kruegers were impressed by Vest’s sincerity and his resolve to improve MIT’s residential system and alcohol policies. Bradley M. Henry, a lawyer in the firm Meehan, Boyle, and Cohen, which represents the Krueger family, feels that MIT’s admission of responsibility for Krueger’s death helped to avoid a lengthy trial. “Charles Vest’s actions and will to come forward and acknowledge the problems has saved MIT a lot of media attention over the next three years,” he said. “It also saved our family having to go through this for the next three years,” Darlene Krueger said. An agreement issued by Leo V. Boyle, the attorney representing the Kruegers, included several promises by MIT to fundamentally change student life. The most significant of these is the assertion that all freshmen will live on campus by August 2002. While administrators have previously stated that the Institute will house freshmen on campus whenever sufficient housing is available, this will give MIT a fixed deadline. “Freshmen will be on campus, not scattered around fraternity houses,” Robert Krueger said. The Kruegers said that they were satisfied with this decision, which will give students sufficient time to learn about the fraternities before making a commitment to pledge. Henry refuted defenses of the current fraternity system, claiming that many colleges originally housed their students in fraternities but later moved them to dormitories. “The argument that I’ve heard is that MIT started its residence system in fraternities.... I understand that it’s a tradition. That doesn’t mean that it’s a good tradition,” he said. Darlene Krueger said that her son joined the Phi Gamma Delta fraternity in an attempt to replace the community of his family. “He was just looking to replace the family that he left. Unfortunately, he didn’t have the supervision that he had at home,” she said. The Kruegers believe that Phi Gamma Delta pledge trainer Charles Yoo ’98, whose diploma was revoked by MIT’s committee on discipline, may have been made the scapegoat for the incident. “Does that compensate for our son’s death? No,” she said. Henry said that MIT needs to give training “about what students need to do in an alcohol-related crisis,” rather than just providing risk-avoidance strategies such as Training for Intervention Procedures by Servers of Alcohol (TIPS). In 1990-1991, an Undergraduate Association subcommittee chaired by J. Paul Kirby ’92 discovered that there were serious problems with MIT’s alcohol policy. Kirby later sued the Institute when MIT refused to publicly release these documents after Krueger’s death. 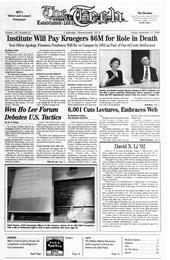 “These are things that MIT’s own committee with MIT’s own administrators was saying in 1991,” Henry said. According to Henry, the subcommittee’s recommendations were ignored because of a lack of funding.